Much of BEG's current work in Clastics Research centers on subsurface analysis of moderate to large-scale systems of the Tertiary Gulf Coast. Our integrated, multidisciplinary research teams combine relevant aspects of conventional-core, well log, and seismic data. All studies begin with and then capitalize on time-stratigraphic and tectonic-stratigraphic integrations, in which the latest techniques in well log and seismic sequence stratigraphy are applied, and seismic facies and 3-D visualization applications. 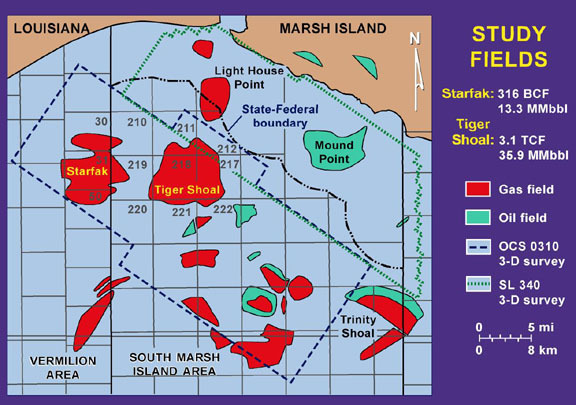 The deep-shelf gas play in the Gulf of Mexico (GOM) is focusing exploration attention below 15,000 ft in the shallow waters of offshore Texas State leases. Ultradeep wells targeting large structures below the present-day Texas shelf are planned to be drilled to depths from 20,000 ft to as much as 30,000 ft for sandstones deposited in deep-water depositional settings. At these depths the greatest unknown and most critical risk factor is reservoir quality. The ability to predict reservoir quality (porosity and permeability) and physical characteristics of ultradeep reservoir rocks has lagged behind our understanding of other parts of the petroleum system, such as depositional facies, traps, and petroleum migration. The unknowns that remain about reservoir quality in these ultradeep drilling targets make this a critical area for further research. To address these risks, BEG formed a consortium of companies to focus on the stratigraphic architecture and distribution of primary depocenters and the understanding of diagenesis and reservoir quality of deep Gulf Coast sandstones below 15,000 ft. Our major research goal is to decrease the exploration risk of sandstone distribution and reservoir-quality prediction by (1) mapping from seismic data general stratigraphic architecture and areas of deep to ultradeep primary depocenters and (2) understanding the uncertainty involved in preservation or enhancement of porosity and permeability at depth. Our project should encourage drilling activity by focusing exploration on lower risk areas and preventing drilling below reservoir basement. Our work can (1) focus deep exploration on areas of thicker lowstand systems tracts, (2) provide methods for forecasting reservoir quality in deep to ultradeep sandstones, and (3) form the basis of later site-specific diagenetic modeling studies where numerical models can be applied. Example of deep-water slope and basin-floor-fan systems in the Laguna Madre-Tuxpan area. 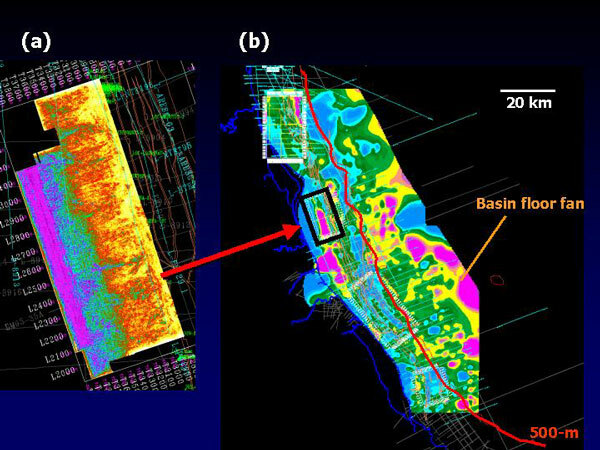 (a) Maximum amplitude map of slope channels and levees (b) Isochron map of basin floor fans developed seaward of the 500-m isobath. A new, 18-month evaluation of basin-scale oil and gas systems in the Laguna Madre-Tuxpan area, located north of the Veracruz Basin, Mexico, demonstrates that a variety of plays and exploration opportunities exist in downdip areas in basin-floor and slope systems. Other areas of the basin in major fault-bounded depocenters contain numerous three-way fault-seal opportunities at many stratigraphic levels. Identification and mapping of these plays will yield a structural and stratigraphic framework for existing prospects and hold the promise of helping us identify a spectrum of additional opportunities in the basin. Basins offshore to a water depth of 500 m. The study area covers six 3-D surveys and intervening 2-D seismic lines and links the Veracruz and Burgos Basins. Plays in the Laguna Madre-Tuxpan study are defined from mappable geologic attributes. This study uses a threefold definition for plays based on (1) sequence-stratigraphic occurrence and age, (2) facies association, and (3) trap. Examples of Laguna Madre-Tuxpan plays defined in this study are the Upper Miocene Slope Channel/Levees and Upper Miocene Canyon, Stratigraphic Trap plays. Laguna Madre-Tuxpan plays are structurally and stratigraphically complex, affording us a unique opportunity to examine a complete coast-to-basin succession from valley fill to basin floor over a distance of less than 25 km. A dynamic, tectonically active setting, coupled with an abundant sediment supply, has resulted in a greatly telescoped system. Narrow shelf margins in the Laguna Madre-Tuxpan area represent an end member in the spectrum of shelf-margin types and should be of significant worldwide interest. Key challenges in the exploration and development of natural resources are the evaluation of reservoir presence and quality in data-limited, frontier basins, and the characterization of connectivity and heterogeneity of reservoirs. 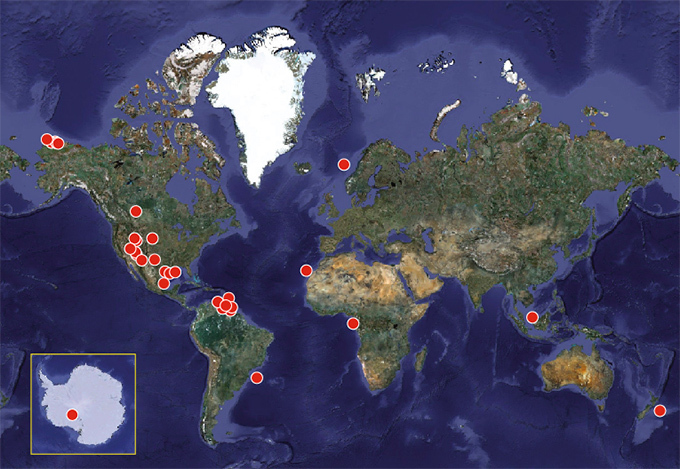 The Quantitative Clastics Laboratory (QCL) is a Jackson School of Geosciences collaboration between the Department of Geological Sciences, the Bureau of Economic Geology, the University of Texas Institute for Geophysics, and industrial affiliates designed to address these challenges. QCL researchers carry out integrated geologic studies at multiple scales to develop models for processes and controls in sediment transport and the stratigraphic evolution of depositional systems. They use subsurface, outcrop, Earth surface, and marine geology datasets to evaluate predictive, source-to-sink relationships between hinterland, fluvial, shoreline, shelf, slope, and deep-basin environments. Researchers also develop concepts for the prediction of stratigraphic architecture and controls on the evolution of fluvial, shallow-marine, and deep-water depositional systems, and they aim to determine the impact of facies modeling on reservoir performance of these systems. Results are deployed to industrial affiliates in a quantitative format, which facilitates probabilistic assessments and modeling of oil and gas reservoirs. The program was established in 2001 and is funded by a consortium of oil companies. We have also been supported by numerous software vendors and foreign energy ministries. The QCL is widely considered the world's premier research group in the application of seismic geomorphology to reservoir characterizations and the provider of outcrop analogues for reservoir models. The Burgos Miocene project, completed in February 2004, started in mid-December 2002 and was funded by PEMEX Exploración y Producción. The study was a continuation of collaborative Bureau-PEMEX investigations of the geologic framework, petroleum systems, and hydrocarbon plays of Neogene strata in southeastern, eastern, and northern Mexico (Veracruz and Macuspana Basins and the Laguna Madre-Tuxpan area), conducted from 2000 through the present time. This study extended analysis to the Miocene strata of the onshore and offshore Burgos Basin of northeastern Mexico. The primary objectives of the project were to define the sequence-stratigraphic, structural, petrophysical, geochemical, and petroleum-engineering characteristics of the Miocene succession in the Burgos Basin. The emphasis of the project was to develop a play framework to help guide PEMEX exploration efforts in the virtually unexplored offshore part of the basin. The study used an extensive database comprising ~40,000 km of 2-D seismic lines, log suites from 122 wells, and a variety of production-test, gas-seep, and gas-show data. The 15-month Burgos project defined and mapped 20 regional Miocene plays in 39,700 km 2 of the central (onshore) and eastern (offshore) Burgos Basin. These plays were defined on the basis of age (four Miocene chronostratigraphic zones) and five mappable areas (unexpanded shelf, expanded shelf, slope, basin-floor, and diapiric onlap), extending offshore to the 500-m isobath. Ranking of the plays involved a qualitative procedure based on a systematic evaluation of five key play elements: reservoir presence and quality, trap, seal, source, and migration. The study also provided a structural, stratigraphic, and play framework for existing PEMEX prospects and future exploration areas in the basin. The Miocene plays are structurally complex and are characterized by local and regional detachment systems, growth faults, and an associated regionwide pattern of downthrown extensional rollover folds, pervasive secondary faults, and salt and shale diapiric masses that dominate the east part of the basin. The Burgos Basin appears to be a transitional zone between gravitational collapse in offshore Mexican basins to the south and salt-related raft tectonics of the South Texas Gulf Coast. The basin thus offers high promise for gas reservoirs containing a variety of trap styles. The Offshore Secondary Gas Recovery (Offshore SGR) project was completed in 2002. Detailed architectural frameworks have been developed to model reservoir flow patterns and target bypassed zones. Stratigraphic and saddle-perched structural traps have been defined to extend traditional field boundaries and open up new targets. Stratal slicing (or proportional slicing) was used to create more coherent amplitude maps for initial identification of several low-sinuosity, high-amplitude features throughout the data volume. One of two prospect ideas developed by the team and successfully drilled by industry partner Texaco contained probable recoverable reserves of 5.7 Bcf. Offshore SGR, a joint venture between the Bureau and the U.S. Department of Energy begun in 1998, was charged with identifying new technologies and processes to aid in the recovery of hydrocarbons from known fields. The completed project extended investigations into the northern, offshore Gulf of Mexico (GOM) Federal Outer Continental Shelf, where nearly 10,000 gas- and oil-producing reservoirs are found in more than 1,000 fields. The research focused on the Miocene-age reservoirs that comprise 42 percent of original proven reserves in the GOM. Because of the stratigraphic and structural complexity of the Tertiary-age section in this region, there is potential for significant gas resources to have been bypassed even in densely drilled fields. The joint Bureau-PEMEX Exploration and Production study of the Macuspana and Veracruz Basins in Eastern Mexico was completed in December 2001. The gas plays in the Miocene-Pliocene section of the on-land and offshore portions of the basins were defined and assessed during this 20-month project. The multidisciplinary, integrated study provided a regional synthesis of the geological framework, petroleum systems, and petrophysical and engineering characteristics of the basins. The study involved close cooperation and participation of PEMEX management and staff.